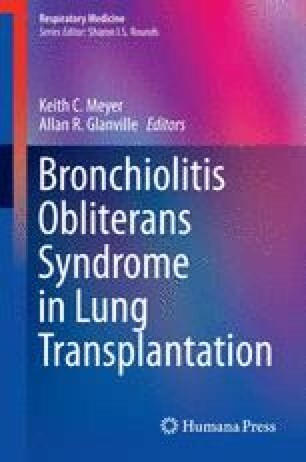 Bronchiolitis obliterans syndrome (BOS) remains the leading obstacle to better long-term outcomes after lung transplantation. The incidence of BOS approaches 50 % within 4 years of transplantation, and the median survival after the diagnosis of BOS is approximately 3 years. Because BOS is generally thought to represent chronic alloimmune-mediated rejection, the mainstay of therapy has been intensifying immunosuppression. However, the response to treatment is poor, and the typical clinical course is characterized by progressive allograft dysfunction. Total lymphoid irradiation (TLI) and extracorporeal photopheresis (ECP) are used at some centers, although they are usually reserved as salvage treatments for refractory BOS. Re-transplantation is the ultimate treatment option, but the donor organ shortage and generally marginal outcomes have limited its widespread use.